We have returned!The past two months have been hectic for projects, but it is time for more Kav and Tony. 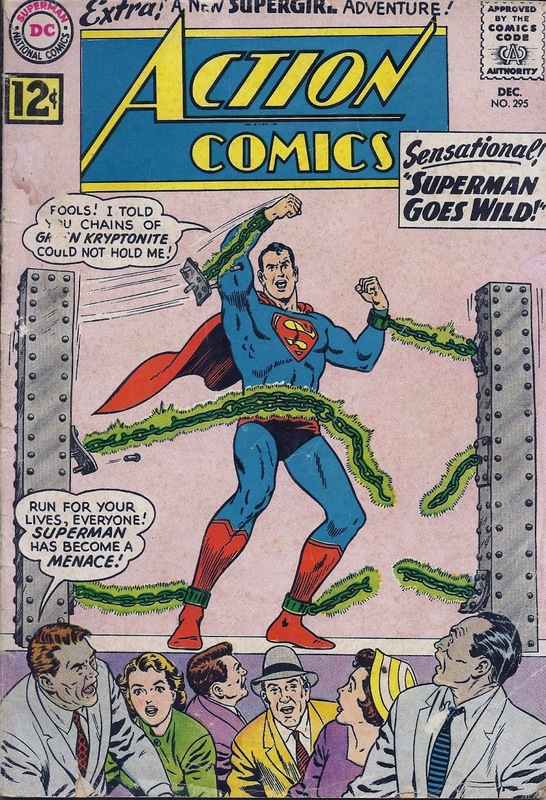 This week, we are beginning a review of Action Comics #295 titled 'Superman Goes Wild'. It was published December, 1962. The writer was Henry Boltinoff, the pencils were by Curt Swan, and the inks were by George Klein. 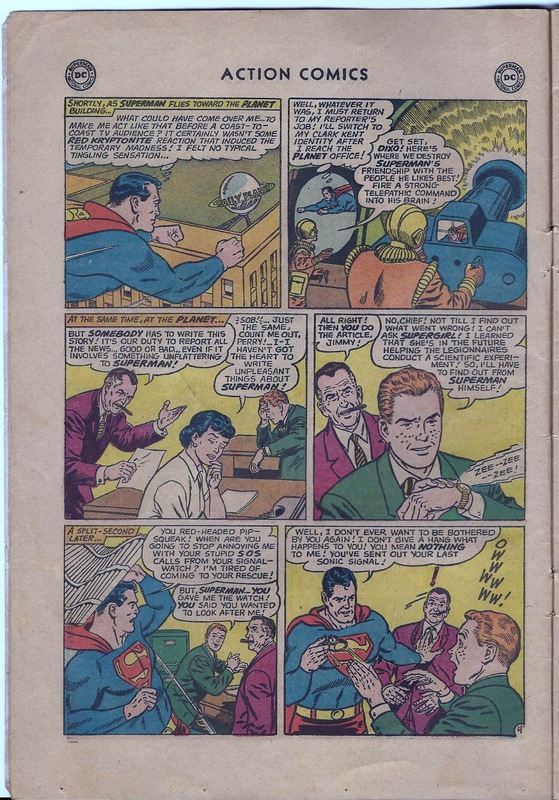 KAV: Here we go with another one of those stories where Superman turns evil. This happens so often you'd think everyone was used to it by now but no. 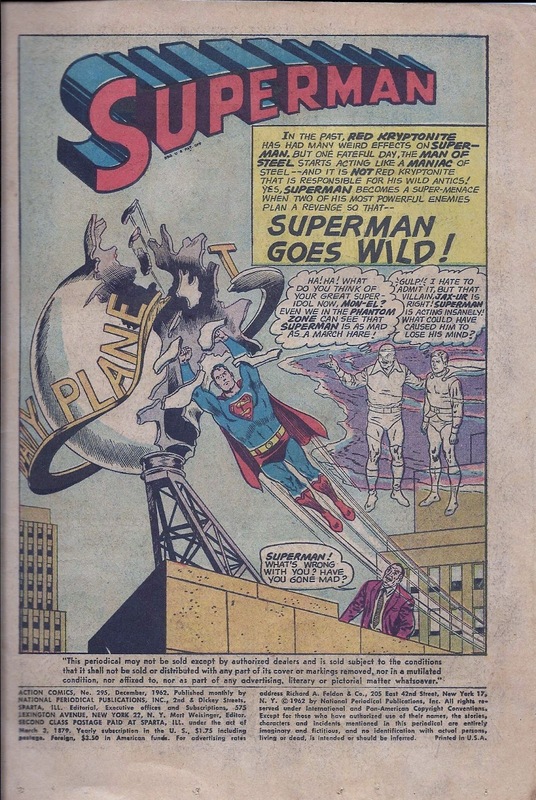 In the splash page I notice the Daily Planet globe is smaller than usual. I noticed this about his fortress key also-it varies in size more often than Gary Busey's bank account. TONY: I'm not familiar with Mon-El or Jax-Ur, but I have a feeling these two are going to fight for the title of Most Memorable Assclown in A Superman Comic Book. KAV: Ok Superman comes out with the largest diamond ever-and he's going to break it into smaller diamonds. This is stupid-diamond cutters always try to keep a diamond as large as possible, only cutting it to remove flaws. This is taking a billion dollar diamond and cutting it into 103 pieces which are worth 5 million each, effectively halving its total value. Stupid. TONY: Ron Paul supporters are already loving this comic due to the anti-UN angle. All we are missing is some speech about backing the gold standard. 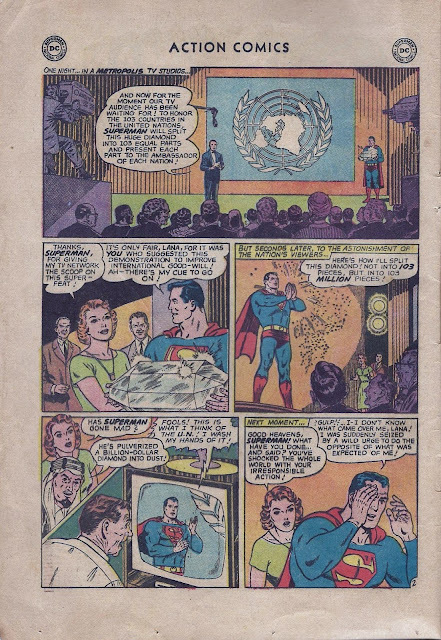 It's fantastic that Superman knows he is crushing something into 103 million pieces. KAV: We have Dixo of the Stupidman Revenge Squad explaining the plan to Vagu, who returns the favor by explaining back to him. Vagu calls home base and explains his plan to the boss, who warns him not to screw up. Way to motivate the troops numbnuts. If I was Vagu I would have replied "Yeah, you're right-nevermind. Instead of trying to get revenge on Superman, we'll do something else." TONY: The Superman Revenge Squad? That's it. I'm finished. See you in two months. KAV: WOW! I didn't know the media was biased in the 60's like it is today-refusing to report a negative story about a famous person they support. Pretty lame reporting guys. I hear MSNBC is hiring. Or is it firing? I get mixed it up. 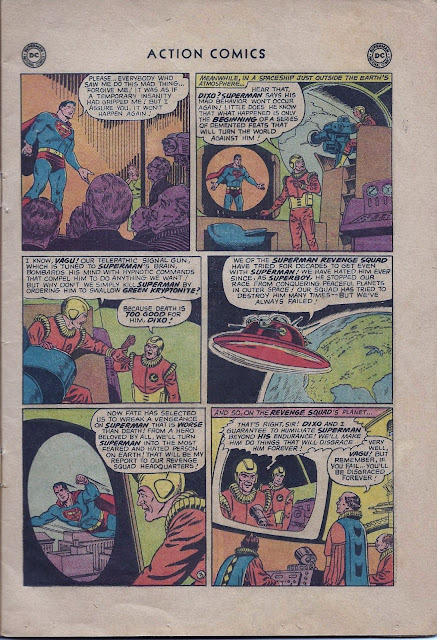 TONY: I love how when they need someone in the Golden and Silver Age DC Universe, they are off doing something INCREDIBLY IDIOTIC in another galaxy or the future. Supergirl is in the future with 'The Legionnaires'? Are you kidding me? A scientific experiment? I hope they are coming back with the cures to some horrific diseases. That's all we can handle this week, folks. We'll be back next week with more action.